Parsnip soup is one of my favourites. I like it spiced or with apple, but I’d never thought to use spinach and make it green until I saw Nigella do it. Of course, by the time I got around to making it, I couldn’t remember what ingredients she’d used other than parsnip and spinach. I hunted for the recipe online, but it was not to be found. Fine, I thought, I’ll make an amalgam of my two usual recipes and throw in some spinach for good measure. I decided I’d test out the soup function of my new ThermoCook whilst I was at it. How incredibly simple. I threw all the ingredients into the ThermoCook, selected the chop function, followed by smoothie followed by the thick soup programme and away it went. Twenty minutes later, I had a tasty hot jug of spiced parsnip spinach soup just waiting to be downed. And it really was very tasty, just right for a chilly wet Cornish winter’s day. A quick, delicious and nutritious meal with sweetness from the parsnips, acidity from the apple and earthiness from the spinach. The additional flavour from the spices makes this an ideal winter warmer. Place all ingredients except spinach and coconut cream into a large covered pan. Add the spinach and simmer for a further 5 minutes. Add the coconut cream and blitz with a stick blender. Place all fruit, veg and roots into the jug and chop for 1 minute. Add the remaining ingredients, except coconut and select smoothie. Select thick soup and cook for 20 minutes. Add the coconut cream and stir at speed 3 for 10 seconds. I’m sending this spiced parsnip spinach soup off to No Croutons Required with Lisa’s Kitchen and Tinned Tomatoes. If you make this spiced parsnip spinach soup, I’d love to hear about it in the comments below or via social media. A photo is always good too. For more delicious and nutritious recipes, follow me on Twitter, Facebook, Instagram or Pinterest. The post contains affiliate links. Buying through a link to a Froothie product will not cost you any more, but I will get a small commission. This helps keep Tin and Thyme blythe and blogging. Opinions are, as always, my own. Although I’m not keen on roasted parsnips, I love spicy parsnip soup and I love the sound of adding spinach and coconut cream. Yum. this looks fabulous! I love the addition of spinach too. My apple and parsnip soup (thanks for the link) was very popular and got so much traffic which is odd for such a simple food. It is soup month though and always nice to see so many recipes. I could do with a bowl of yours now please. PLEASE! I had some parsnip soup with curry for the lunch too. I like the add of apples in this soup..yum! 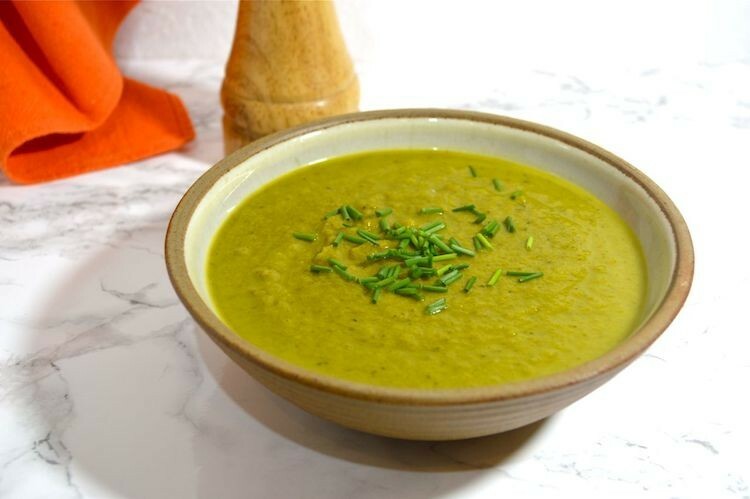 I love the flavours you have used here and have just posted a soup wthat combines veg with fruit too, I love this combo as much as you! We’re big soup fans, but we tend to just chuck in whatever we have to hand, so it’s always different. Sometimes it’s nice to have something a bit more specific. Parsnip makes such a fine soup for these winter days and I’m all for adding some extra healthy veg. Parsnips and Indian-style spices is such a perfect combination but I don’t think that anyone thought of it before Jane Grigson in the 1970s. What did we do with parsnip soup before that I wonder? Good point Phil. It must have been the 70s when spices really took off in this country. It’s hard to imagine cooking without them now. I love parsnips. They’re perfect for a soup. Never tasted with spinach; I’ll give it a go! Spinach was a good addition I found Manu and I’ll use it again. Great recipe for the ThermoCook. I put spinach in as many dishes as I can, I love it! Thanks Janice. We tend to use chard mostly as it grows so easily, but spinach makes a nice change. What gorgeous colour Choclette! I bet this is super-tasty, I love parsnip with warm spices like turmeric, ginger and garam masala. Will bookmark this to try in my ThermoCook very soon! Yes spicy parsnip soup is a firm favourite with me too Kate. I am really into turmeric so I can not wait to try this soup out! what a great healthy option! Turmeric is such a great spice, I like the flavour and the colour and as an added bonus, you get health benefits – win, win, win. I keep seeing recipes using turmeric root – I wish we could get that up here, but even using dried I bet this soup is AMAZING! Perfect for the cold we’re having! Thanks Elizabeth. Turmeric isn’t that easy to find down here either, so if I do happen to come across any, I buy quite a bit. It generally lasts quite a long time if you keep it in the cool. Yes I guess parsnips must have seemed rather strange when you first tried them Jeanne – hadn’t thought of them as a novel crop. I’ve noticed everyone seems to be into turmeric at the moment. I love the flavour and health benefits of course, but really I just love the wonderful colour it gives. A beautiful vibrant bowl Choclette. The combination of ingredients sounds so good! Really love the use of fresh turmeric and ginger……. all sounds very exotic and delicious! You’ve made me see the soup with new eyes now Kate. Exotic? Well! Great blend of flavours here. Parsnips are a wonderful addition to soup and I like that you added spinach too and a bit of spice. Thanks so much for sharing with NCR. Thanks Lisa, I was really pleased with the spinach addition. Oh dear, sorry to hear that Janie. Sounds like a fab idea though – if only work didn’t get in the way! Oooh what a lovely combo Choclette! Thanks Jan, adding spinach is not something I would have thought of, but it’s a good addition. Fabulous flavours Choclette. Love it! Tweeted, stumbled and yummed. Thanks Jac, the spinach made it feel so much healthier somehow.